Capri by the Sea condominium, beach resort home in Southern California. This sixth floor condo at 'Capri by the Sea,' is in San Diego's only beachfront High Rise Rental Condominium. During your stay you will enjoy all the comforts of home on the seashore. Located directly on the broad sands that stretch from La Jolla to Mission Bay, this sixth floor condominium takes in an unparalleled panorama of the Pacific Ocean. Be our guests.... Get away from it all and let the ocean restore you. This Two Bedroom, One Bath, OCEANFRONT Property includes PANORAMIC OCEAN VIEWS, A Fully-Equipped Kitchen, Microwave Oven, Dishwasher, Seating For Six, Two Color TV's With Cable, Complimentary High Speed Wired AND Wireless Internet Access, Coin-Operated Laundry Facilities, 24 Hour Onsite Security and Caretaker, Outdoor Heated Pool, Covered Designated Parking for One regular sized Vehicle (parking is available for large vehicles and campers or for an additional vehicle for a $25.00 fee), Spa, Sauna, Barbecues, Elevators and a Rooftop Lanai. There is a Queen-Size Bed in the first bedroom, a Queen bed in the second Bedroom and a Sofa Sleeper in the Living Room. Please be our guests. 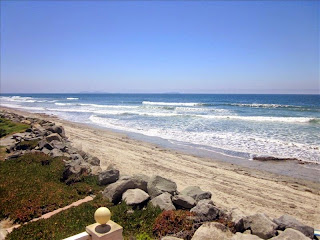 Capri by the Sea Condo Rental in San Diego CA..